New Berwick manager Robbie Horn didn’t get off to the best of starts as his side were dumped out of the Challenge Cup, beaten 5-0 at home by Queen of the South on Saturday. But Horn (pictured with chairman Len Eyre, below)admitted afterwards that he wasn’t too downhearted. “Queen of the South are a good side who are going well in the Championship,” he said. “Fortunately, I don’t think anyone will judge us on this game, it is our performances in the league that they will look at. “As it was I think there were a few positives to take out of the first half. We contained them well, and what we have to remember is we had a few players missing, and some of the lads who started haven’t played a lot of football so far this season. Rangers, with six players unavailable, gave a debut to new loan signing Marcus Godinho from Hearts, while central defender Jonny Fairbairn made a rare start. “We have to put this one down to experience,” said Horn. 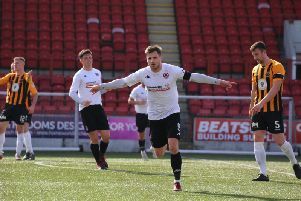 “We have something to work on in training and now it’s a case of rebuilding everyone’s confidence ahead of our next league game (away to Edinburgh City).